Sink exceeded expectations. Gives a warm texture to the kitchen. The copper is ever changing! Love it would buy again! Everyone comments on the look and quality of this sink. Perfect balance of design and usability. 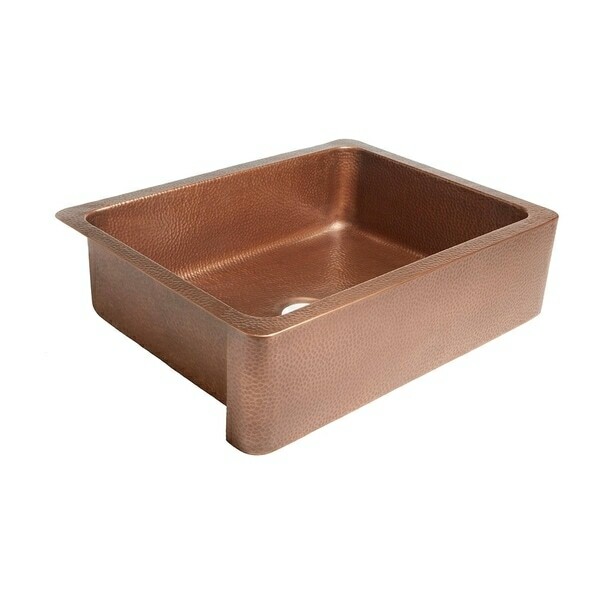 The Courbet 30in apron front farmhouse copper sink makes a statement in any kitchen design. Making a farmhouse copper sink the focal point of your kitchen creates an immediate and stunning impact. With hassle-free installation and effortless care, a copper sink from Sinkology is designed to fit your lifestyle and be a point of pride for your home. Handcrafted from 16-gauge pure, solid copper, this apron front sink comes with a lifetime warranty. Outer Dimensions: 30" x 22" x 8"
Inner Dimensions: 27" x 19" x 8"
Dimensions 36.0 In. X 27.0 In. X 13.0 In. Loved this sink but we returned for the bow out Sinkology to add more “ pop” to our kitchen ( glad we did ) but any of these Sinkology copper sinks are gorgeous and well worth the money !! Great addition to anyone’s kitchen adding warmth and classiness - will be a focal point of your kitchen Love these sinks ! Although we have not installed or sick yet, it is burrito and such a statement piece! As beautiful as I thought it would be and looks GREAT in my newly renovated kitchen! Love this sink, even nicer in person. Heavy gauge and substantial. The hammered copper is such a nice design technique that makes this sink a standout centerpiece in my kitchen. I purchase this copper sink to install in a clients home. I paired it with a leathered granite top and installed it as an undermount. The homeowner is very happy with the product and the quality of the sink. I love the look of my sink! Easy install, great value. Perfect addition to my farmhouse kitchen. Highly recommend.. This sink is just beautiful and looks better than I imagined. It arrived well packed and in perfect condition. I can't wait until our cabinets and counters are in so we can install it. It will definitely be a show piece in our newly remodeled home. PS- we have the sink installed with our new cabinets and I am in love with it. This sink is even more stunning in person than online. It is a show stopper and a wonderful addition in the kitchen. A great product at a great value. Love this sink! Beautifully made and it came in perfect shipping thanks to good packaging. Im using it for my sink in my newly renovated laundry room. This sink is beautiful! Great product for the price! Looks well made. It's a little darker than the picture which is what we were hoping for. Can't wait to use this in our new kitchen! This arrived looking exactly like it did in the pictures and any part that has not touched water looks the same after about 18 months. But beware if you have never had copper before-you have to like the uneven patina that occurs over time unless you want to scrub it every day. BEAUTIFUL!! Contractor used this in a custom build sink. Great size. Perfect for the space. This just arrived and so I've only opened the box up and checked it's condition. It's exactly as described and was packed very well. I can't wait to get it installed. Remodeling our kitchen in our log cabin and think this will be an awesome addition. "Will this work with a 33 inch wide cabinet - kitchen remodel. Thanks"
"For those who have had the sink for awhile, have you had issues with rust?" "where can i find a bottom grid for this sink?" At this time we do not have a bottom grid available for this. We apologize for any inconvenience we might have caused. "Is this an undermount sink?" It is not, slid into cabinet to show the front apron. "Does this sink have an aprint front? Thanks! Diane"
It is a farm house style sink, so it is a little different than an apron front. When installed it looks the same, you just have to install it slightly different! "Does this sink have a locking channel? Will a base cabinet measuring 36wide by 24deep accomodate this sink?" Hello marie, thank you for your inquiry. Unfortunately, the information you have requested is currently unavailable. You will receive an email notification once an answer is posted. Have a great day. This sink doesn't have a locking channel, just a flange around the rim. Yes, this sink will fit in a cabinet base 36x24. The sink will fit in a 36" apron front style cabinet that you can cut the opening to fit the sink dimensions.